The quick-fix rule to decide the size of the TV to buy: Distance (in inches) from TV to your eyes ÷ 1.6 = Optimum diagonal length of TV. For this, consider the distance between your HDTV set and where you and your family will be sitting while watching it. For minimum TV size, the formula is ‘viewing distance/3’, and for maximum size, it is ‘viewing distance/1.5’. So, if you watch TV from eight feet away (96 inches), your minimum TV size should be 32 inches (96/3), while your maximum TV size could be 65 inches. Now all you have to do is find a model between this range that best fits your budget. Plasma screens, on the other hand, are capable of the darkest of blacks, smooth picture quality, and flawless performance when it comes to reproducing motion on the screen. This technology is ideal for fast-paced sporting action. However, plasma screens are energy guzzlers, consuming nearly twice the power of LCDs. And lastly, there are LCD TVs that use ‘light-emitting diodes’ to illuminate their screens. Until recently, all LCD TVs were backlit by always-on, CCFL (cold cathode fluorescent) lamps. These displays are backlit by an array of LEDs (light emitting diodes) directly behind the screen. This enables localised dimming – meaning immediately adjacent areas of brightness and darkness can be displayed more effectively – and greatly improves contrast. LED TVs are also more power efficient and capable of a wider colour gamut than CCFL sets. The LEDs of the backlight are mounted along the edges of the panel. This arrangement enables radically slender displays and offers superior contrast levels to CCFL, but can’t achieve the same picture quality as directly lit LED sets. However, they do come in far cheaper which is why most LED TVs out there now use this technology. The backlighting on OLED (organic light emitting diode) sets is achieved by passing an electric current through an emissive, electroluminescent film. This technique produces far better colours and higher contrast and also enables screens to be extremely thin and flexible. This is the holy grail display technology and only in 2014 did a bigscreen OLED TV go on sale. So it’s brand new, it’s expensive and the top brands are still struggling to get their heads around it. PDP (plasma display panel) TVs use glass panels containing millions of tiny cells filled with a mixture of inert gases. Electricity excites the gases, causing them to illuminate the pixels across the screen. Plasma, while arguably superior to LCD in terms of contrast and colour accuracy, is only viable on large (42in+) screens and has been dropped by all but a handful of manufacturers. Some manufacturers are now making TVs that have slightly curved screens. LCDs and plasmas produce different sorts of pictures. Broadly speaking, the former’s are usually sharper, brighter and more densely saturated, while the latter’s tend to be richer, more natural and produce better black levels. And finally, before finalizing a set, check for viewing angles. Some TVs will give you the best display only if you’re sitting right in front of it. Move to the right or left and you will see some shift in colour. This shift is defined by the type of panels used: Twisted Nematic (TN), Vertical Alignment (VA), and In-Plane Switching (IPS). IPS screens offer the best viewing angles, while TN are the worst. Opt for an IPS screen if you are buying a television set for your living room. At anything below 46 inches, it’s difficult to tell an HD TV apart from a Full HD TV unless you are watching a Blu-ray movie at a distance of less than eight feet. If that’s your seating arrangement and viewing style, then Full HD would be worth it. These criteria include at least one HDMI port and component video inputs as well as a resolution of at least 1,024 x 768-pixels. Meanwhile, full HD TVs have a higher resolution of 1,920 x 1,080 pixels. The resolution of Ultra HD is exactly four times higher than full HD – 3840 x 2160. It means a far more detailed picture, with content requiring a lot more bandwidth and storage space. 4K TVs tend to be good at upscaling HD video to Ultra HD but there are currently very few options for watching native 4K content. Depending on your budget you can also opt for a Smart TV. These come with a range of apps for web services such as Skype, Twitter, Facebook, YouTube, Picasa, etc – and connect to the internet via an Ethernet cable or wirelessly through Wi-Fi . Here, you will need to check if the set has Wi-Fi built-in , or is Wi-Fi Ready. For the latter, you’ll need to buy a separate dongle to access your Wi-Fi network.Importantly, just because a TV comes with a USB port, does not mean it will support an external hard drive, or will even play videos from a pen drive. So check what digital media formats it supports – and more importantly, if it can read portable hard disks. HDMI ports are important as it is fast becoming the standard for connecting a device to your screen. Ideally, look for something with three HDMI ports, but don’t settle for anything less than two ports.If your budget permits it, definitely go for a smart TV with built-in Wi-Fi. Right now, the use of this is limited because there aren’t enough apps and services in India. supports AVI, MKV, MP4 and several other video formats. If you plan to use a portable hard drive with your TV, make sure the model supports the size of your disk. In budgets under 25,000, you will only get sets that support 250-320GB drives or external hard drives with their own power supply. For a living room TV you should be looking for a minimum of 3 HDMI inputs. If you want to attach a set-top box as well as games consoles etc, those HDMI ports will fill up fast. If you enjoy watching streaming internet video from services like Amazon Instant Video, Netflix, and Hulu on your TV and don’t have a device that supports them–like a game console, Apple TV, or Roku player–a smart TV could be something for you to consider. 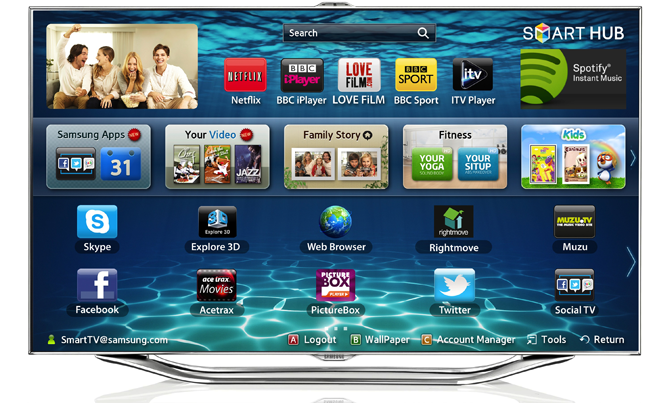 Smart TVs allow you to access to streaming video services and will often let you access services such as Twitter, or do things like check the weather and news without needing a computer. All the best TV brands, including Samsung, Panasonic, LG and Sony, offer 3D TVs. 3D TVs polarise the original 3D pictures into separate images. Seen with the naked eye, the picture appears to be blurred, but if you put on 3D glasses, the separate images are directed to either your right or left eye, creating the impression of depth.for the best 3D experience you should watch from the optimal distance. Measure four times the height of your TV’s screen, and then ensure you’re sitting that distance away from the set. If you’re viewing the TV at an angle, such as 45 degrees, the 3D effect is likely to fade and other picture problems may materialise (see the ‘What’s 3D picture quality like?’ section below). There are two main 3D technologies – passive and active – and each has its own pros and cons. The big TV manufacturers have adopted both technologies, although LG has mostly focussed on passive 3D, while Panasonic, Samsung and Sony are more involved with active 3D. Passive 3D: if you’ve been to the cinema to watch a 3D film, you’ll be familiar with passive 3D. Put on these sunglasses-style specs and each of your eyes see differently polarised light. Your brain then combines the two views to form the 3D picture. Passive glasses are cheap and you usually get plenty of pairs included with your TV, but the 3D picture is not as detailed as active 3D. Active 3D: TVs with active 3D have a higher resolution 3D image. The glasses synchronise with the TV via an infra-red or Bluetooth signal and rapidly blink on and off, playing back images to the right eye and left eye. The glasses are heavier and often more bulky compared to passive specs, and they’re also more expensive if you need to replace them, typically costing between £15 and £30. Passive 3D TVs are sold by LG and are more practical for casual viewing. The 3D glasses cost about 400, so you can buy many of them and call friends over. Also, most of the 3D content you get, like live sports, is made for such passive 3D. Plus, the glasses are light and don’t need batteries, adding to their convenience. Active 3D TVs are sold by Samsung, Sony and a few others and are better suited for film buffs with a collection of the latest 3D Blu-ray discs – but know that it comes at a price as each pair of glasses cost 2,000 or more and needs to be recharged. That said, it’s best to check both 3D technologies to decide on what suits your budget and your viewing habits. You can avail of extended warranty from the manufacturer, but the price varies depending on the store you buy it from. The extended warranty always boosts your default one-year warranty to three years.